Service Objects takes our customers’ success very seriously, which is why we regularly create content to help organizations make heads or tails of their contact data and offer advice for implementing data quality solutions. Some of our blogs strike such a chord that they continue to attract attention far after publication. Here are 5 of our most popular Business Growth and Marketing articles to date, click through to read more. Our most popular blogs have one thing in common: they offer insight to help your team leverage data quality to enhance your business practices. View all of our Business Growth and Marketing content or reach out to let us know what you’d like to see more of. Disposable email addresses – also known as burner emails, throwaway emails, temporary emails or fake emails – are commonly touted as a useful tool for keeping one’s personal or business email address private and clean of spam. Not to be confused with alias email addresses (which generally forward to a primary email address, and are therefore more likely to be read), there are different types of disposable email addresses, and they can work in a variety of ways. Disposable email addresses may sound great for end users, but they can be problematic for legitimate businesses and marketers. One could easily argue that disposables are successfully doing their job when it prevents a marketer from emailing an end user, but this also means that businesses are forced to adapt their marketing strategies. One such strategy: trying to identify these disposable email addresses up front, to have a more accurate view of your email marketing assets. Lists often lack standardization, which can lead to implementation issues. There are many disposable services available worldwide, and some community driven lists and solutions are dedicated to just a single disposable service. These lists frequently contain legitimate records for domains and addresses that are not disposable. In order for a disposable to make it on to a list it first needs to be reported. By the time that happens, and the data makes it way into a solution, the list may already be partially outdated. Moreover, disposables frequently change and not all disposables are reported. Using a list strategy requires constant vigilance. It’s trouble enough staying up to date on just one disposable service, but trying to stay on top of multiple others as well as new ones as they pop up is often a losing battle. Lists of disposable email addresses are a reactionary solution at best. Worse, they only scratch the surface of the problem. Disposables are constantly changing, with new ones appearing and old ones disappearing all the time. It is impractical to rely on a simple list strategy to try and successfully identify a disposable. At Service Objects we like to look beyond simple lists. Instead of looking at one list to perform a simple straightforward disposable lookup, we take advantage of our wealth of data and our years of experience to not only dig deeper, but to also cast a wider net. Our email validation service doesn’t just look at lists, it looks at the whole picture as well as the nitty-gritty. We observe various behavior patterns to better identify specific activities and ties to these activities, not just for disposables but for a variety of email types – malicious or otherwise. This allows us to assign values to these activities and even compare them against other activities. Using complex algorithms along with machine learning we can intelligently determine if a value is directly or indirectly related to a particular issue, such as being a disposable address. As sophisticated as this solution is, note that we won’t always be able to successfully identify a disposable address. Sometimes all the variables don’t match up just right, and sometimes there just isn’t enough data. However, the service will still often be able to identify such email address as being malicious or potentially malicious, in which case you would likely want to reject the email address anyway. 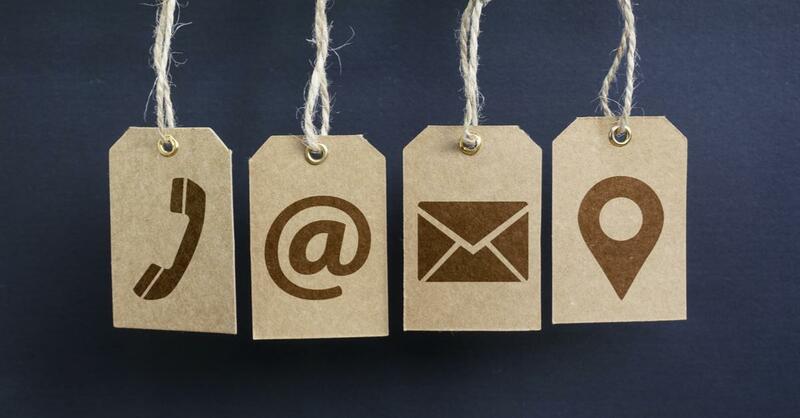 Disposable email addresses are a real headache for businesses and marketers. As with most things regarding email addresses, they are a much more complicated problem than one would normally think. A problem that requires more than a simple list as a solution. They call for a sophisticated solution. Our DOTS Email Address Validation service keeps tabs on millions of domains. It monitors various behavior patterns and leverages multiple sets of data. As domains and data continue to grow, so does the service – becoming smarter and better. The service can adapt to the constantly changing disposables, making it better suited to identify them as they pop up. Not because it’s trying to keep up with them, but because it’s anticipating them. Help Santa Check It Twice: A Holiday Addressing Gift for You! The holidays are fast approaching. Soon you’ll be celebrating the season and sending holiday gift baskets and cards to people you have enjoyed working with this year. 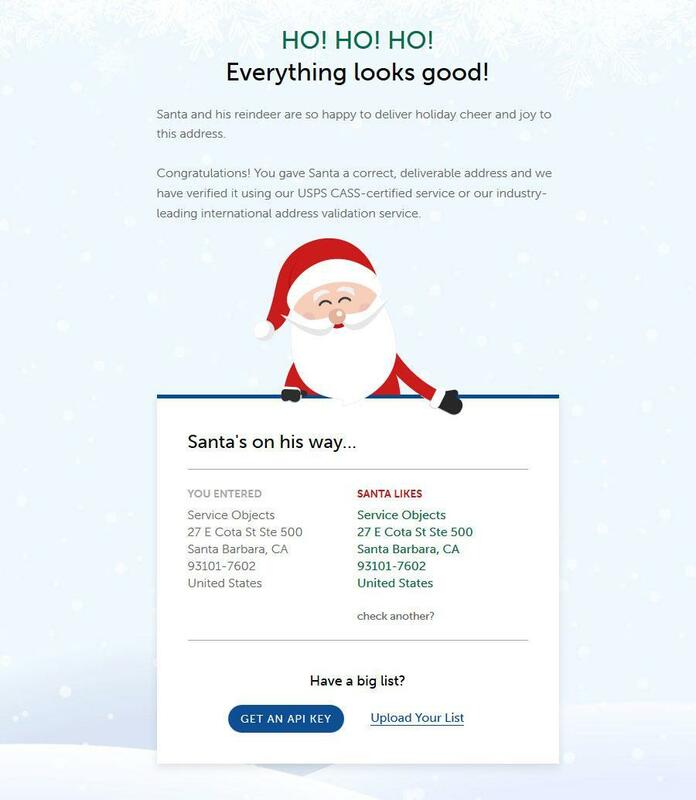 So here at Service Objects, we’ve teamed up with none other than Santa Claus himself, with a great gift for you! 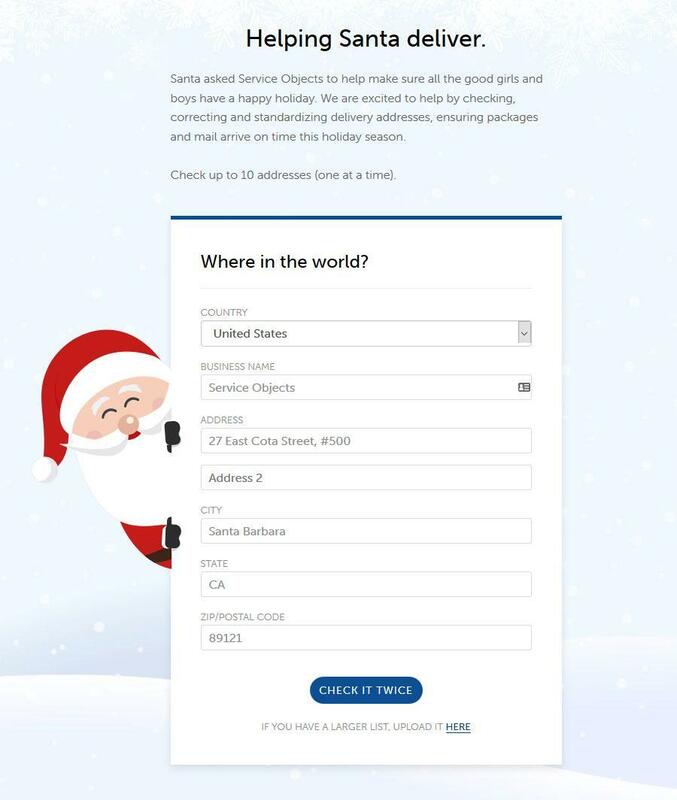 A free web-based portal where Santa will help you verify addresses online, powered by our Address Validation capabilities. It’s ready to use right now. Finally, a little bit of fine print. You will be allowed to look up a maximum of 10 addresses using this tool. This screen will allow you to look up one address at a time, including business names where needed, but bear in mind that we offer convenient API and list-processing versions of these tools as well. 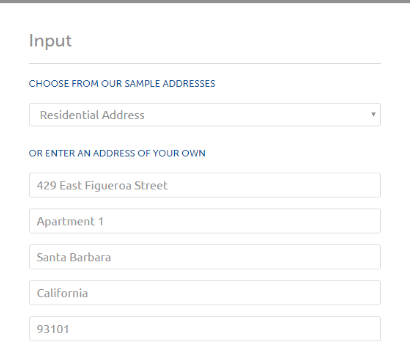 If you need to look up more addresses, no worries – a convenient link will lead you to learn more about our full-feature capabilities, as well as additional information about our phone and email validation capabilities. We’re hoping that once you get a taste of some holiday address verification – and find out how simple it is to implement for your business – you’ll want to have these capabilities for yourself, all year round. 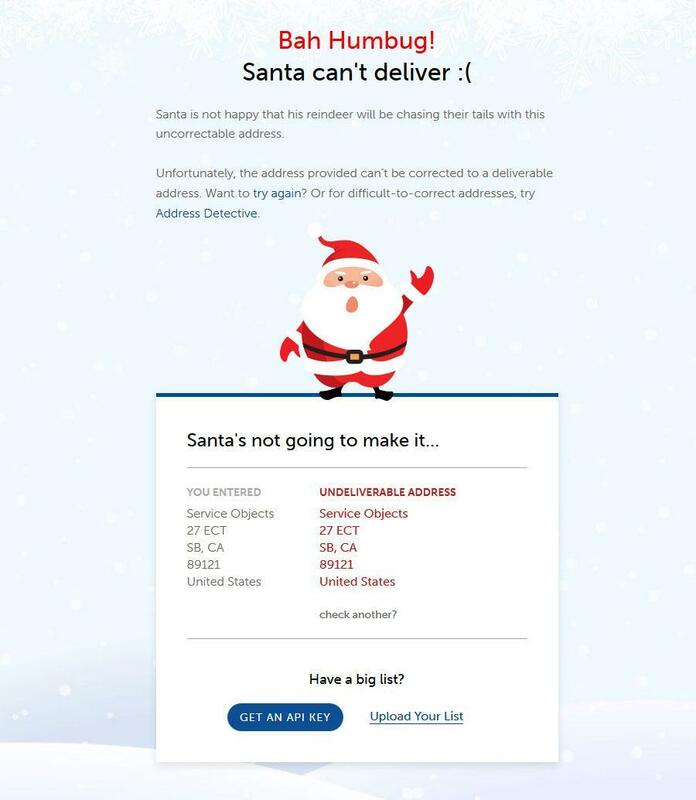 (In fact, Santa confided to us that he and Mrs. Claus will keep using Service Objects tools to improve his own delivery accuracy every Christmas from here, because sometimes even reindeer are no match for automated shipping.) Want to learn more? Talk to our friendly technical experts, and we’ll make it a happy holiday season for you too! How fast is fast? How fast should things be? And more importantly, what can you control to make the response time of using our services as fast as possible? Most people think of response time as being the round-trip time to get your data validated – and this is indeed the primary concern – but total throughput should be addressed as well. And if you are able to get a single validation done as optimally as possible, expanding the workflow to fit simultaneous requests shouldn’t take too much modification to the workflow. Step 1: Data preparation. This is analogous to the steps you take before leaving your home. Did you turn off the lights? Are all of the doors shut? Is the security system armed? Do you have everything on your grocery list? Each of these steps is similar to the checks that your application goes through in order to leave your company’s internal network. The application has to gather the information to be processed, dot all of the i’s, cross all the t’s, make sure it knows where it is going, and make it through any layers of security your company has in place. Each layer takes time to complete and detracts from your overall speed. Step 2. Input data transmission. This is like traveling down the road to the supermarket. How much traffic people encounter depends on factors such as how many lanes the road has, how many people are in each car, and how many cars are on the road. From an engineer’s perspective, this is like the concept of single threading and multithreading: if the road that you are traveling down has multiple lanes, the number of cars (e.g. API requests) can be larger before running into traffic. By creating a multithreaded application, you can effectively widen the road and allow for more throughputs. Your choices include single car + single lane (single value request), single car with multiple people in it + single lane (smartly using one validation client to do multiple requests), multiple cars with single passengers on multiple lanes (semi-smart multithreaded validations), and multiple cars with multiple passengers on multiple lanes (really smart multithreaded apps). Step 3. Data processing. Once you reach the store and make your purchases, it is time to pick a checkout aisle. The number of aisles that are open act similarly to the lanes on the road. More aisles allow a larger number of people to be processed before a queue builds up. This part of the process is handed by Service Objects. We have spent the last 15+ years not only making sure to stock our shelves with the best quality products, but also ensuring that there are enough checkout aisles to meet the needs of our customers. In our case, we have multiple data centers (super markets) with load balanced web servers (smartly managed checkout aisles) to keep all of our transactions moving through smoothly. Step 4. Results data transmission. The return trip from the super market is very much the same as the trip there, but in reverse order. Similarly, entering your house with the newly purchased items (validated data) is the same in the opposite direction. This stage also contributes to the round trip time required to process a request. So total processing time is a careful balance of getting through your front door, navigating down the single or multi lane highway, checking out with your groceries, and then making the return trip home. From an API-call perspective, improvements to your speed start with your network, smart choices when writing your integration code, and juggling the requirements put in place by your business logic. And if you are looking to increase your throughput, a multithreaded application or distributed system will often increase your capacity. Finally, one more analogy (we promise!). Good grocery stores have staff who can help you make the most of your shopping trip. Likewise, Service Objects has an industry-leading team of technical support experts who know their stuff, and are always happy to help you make the most of your implementation. How can we help you? Contact us any time to discuss your own specific needs. We have spoken often on these pages about the importance of validating your contact data, to make sure you have a valid address and a quality lead. Whether it is a mistyped ZIP code, a lead pretending to be Donald Duck to fake out your marketing team, or a phony email address used to commit fraud, problems can and do occur. It takes planning to stay one step ahead of the bad guys or the bad data. Which is why we were fascinated to hear about a new cottage industry that has sprung up in recent years: fake listings on Google Maps. By cataloging the streets and business listings of much of the planet, Google Maps has often become a go-to resource for finding a business. Unfortunately, this has also made this platform a tempting target for shady operators and unfair competitors. 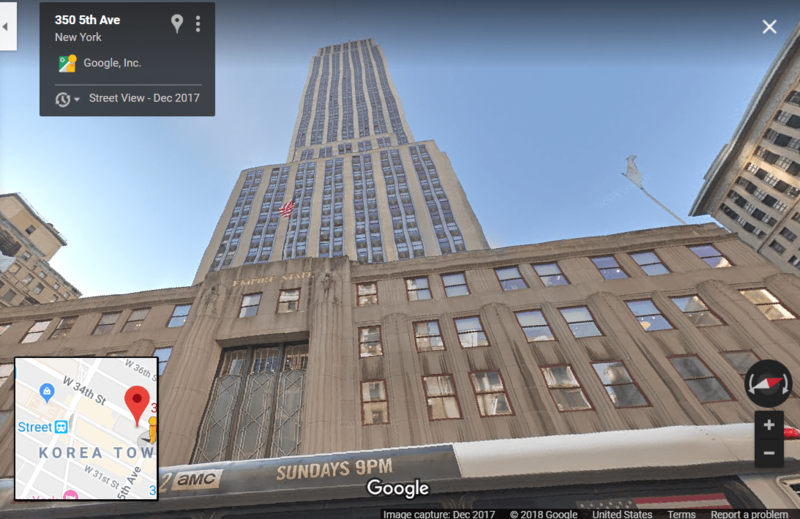 A few years ago, some enthusiasts succeeded in pranking Google Maps with obviously fake business listings, just to show that they could do it. One hacker even managed to plant fake contact information for the FBI and the Secret Service, forwarding callers to the actual agencies while surreptitiously recording the calls. In cases like these, the goal was to try and get Google’s attention about flaws in their system and verification procedures. Contractor fraud: Some types of businesses, such as locksmiths or plumbers, are ripe for shady contractors who come to your home and then charge exorbitant prices. By placing a listing in your neighborhood using a phony address, they are able to swoop down from anywhere on unsuspecting homeowners. According to Google, this represents about 40% of their fake listings. Fake reviews: In this case, real businesses have shadowy people post phony reviews to disparage their competitors or build up their own business – or phony businesses run by fraudsters use fake reviews to give themselves an air of legitimacy. Despite volunteer fraud-hunters and the threat of FTC fines, a listing on Google Maps may not accurately reflect a business’s true ratings. Squatter’s rights: Here a scammer claims a listing for an actual business such as a restaurant, often pocketing online referral fees for customers who actually found this business via organic search. Google notes that 1 out of 10 of its fake Google Maps listing fall under this category. To be fair, Google has made attempts to keep on top of this problem. In a 2017 report on one of their blogs, they note that that have tightened up their procedures for verifying new listings, and now claim to detect and disable 85% of fraudulent ones before they are posted – resulting in a 70% reduction in such listings from their peak in 2015. However, while pointing out that less than 0.5% of searches today are fraudulent, they acknowledge that they still aren’t perfect. The lesson here? As former US President Ronald Reagan used to say at the height of the Cold War, “Trust but verify.” To which we would add, keep your data quality practices up-to-date with your own contact data assets. Good luck, and be careful out there! Here is a question that potential customers often ask: is it easier or more cost-effective to use data validation services such as ours, versus building and maintaining in-house capabilities? We are a little biased, of course – but with good reason. Let’s look at why our services are a lot easier to use versus in-house coding, and save you money in the process. Collecting and using information is a crucial part of most business workflows. This could be as simple as taking a name for an order of a burger and fries, or as complex as gathering every available data point from a client. Either way, companies often find themselves with databases comprised of client info. This data is a valuable business asset, and at the same time often the subject of controversy, misuse, or even data privacy laws. The collection and use of client information carries an important responsibility when it comes to security, utility, and accuracy. If you find yourself tasked with keeping your data genuine, accurate, and up-to-date, let’s compare the resources you would need for creating your own data validation solution versus using a quality third-party service. Human. The development, testing, deployment, and maintenance of an in-house solution requires multiple teams to do properly, including software engineers, quality assurance engineers, database engineers, and system administrators. As the number of data points you collect increases, so does the complexity of these human resources. Financial. In addition to the inherent cost of employing a team of data validation experts, there is the cost of acquiring access to verified and continually updated lists of data (address, phone, name, etc.) that you can cross-validate your data against. Proficiency. Consider how long it would take to develop necessary expertise in the data validation field. (At Service Objects, for example, our engineers have spent 15+ years increasing their proficiency in this space, and there is still more to learn!) There is a constant need to gain more knowledge and translate that into new and improved data validation services. Security. Keeping your sensitive data secure is important, and often requires the services of a team. An even worse cost can be failing to take the necessary steps to ensure privacy, which can even lead to legal troubles. Some environments need as much as bank grade security to protect their information. Done-for-you capabilities. When you use services such as our flagship Address Validation, Lead Validation, geocoding, or others, you leverage all the capabilities we have in place: CASS-certifiedTM validation against continually updated USPS data, lead quality scores computed from over 100 data points, cross-correlation against geographic or demographic data, global reach, and much, much more. Easy interfacing. We have multiple levels of interfacing, ranging from easy to really easy. For small or well-defined jobs, our batch list processing capabilities can clean or process your data with no programming required. Or integrate our capabilities directly into your platform using enterprise-grade RESTful API calls, or cloud connectors interfacing to popular marketing, sales and e-commerce platforms. You also spot-check specific data online – and sample it right now if you wish, with no registration required! Support and documentation. Our experts are at your service anytime, including 24/7/365 access in an emergency. And we combine this with extensive developer guides and documentation. We are proud of our support, and equally proud of all the customers who never even need to contact us. Quality. Our services come with a 99.999% uptime guarantee – if you’re counting, that means less than a minute and a half per day on average. We employ multiple failover servers to make sure we are here when you need us. We aren’t trying to say that creating your own in-house data validation solution can’t be done. But for most people, it is a huge job that comes at the expense of multiple company resources. This is where we come in at Service Objects, for over 2500 companies – including some of the nation’s biggest brands, like Amazon, American Express, and Microsoft. The combination of smart data collection/storage choices on your end and the expert knowledge we’ve gained over 15 years in the data validation space can help to ensure your data is accurate, genuine and up-to-date. Be sure to look at the real costs of ensuring your data quality, talk with us, and then leave the fuss of maintaining software and security updates and researching and developing new data validation techniques to us. 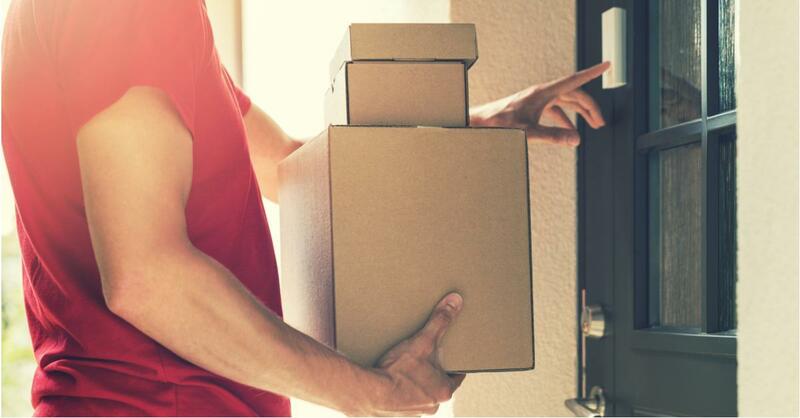 More Than an Address: What is a Delivery Point? Most people think that they mail or ship things to addresses – and they would be wrong. And the reasons for this might be very important to your bottom line. 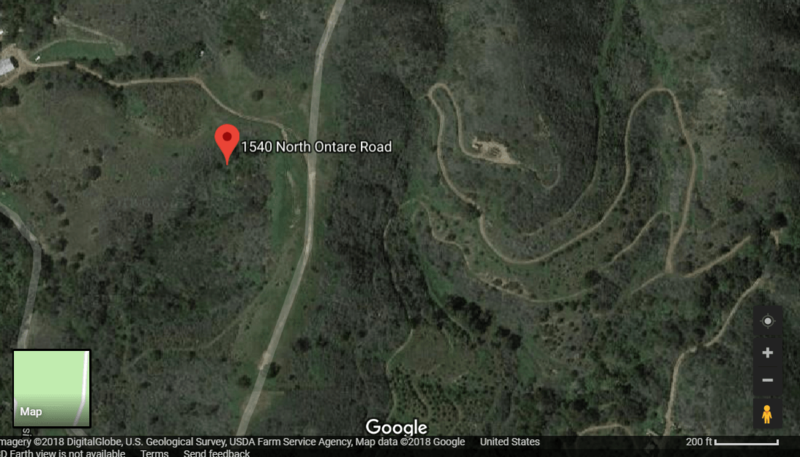 First, let’s look at one actual address here in our native Santa Barbara, California: 1540 N. Ontare Road. This address is quite real. (In fact, its property is currently for sale on Realtor.com.) But we wouldn’t recommend shipping a package there – at least not yet – because at the moment it is a vacant 20-acre lot. These are both examples of the differences between an address and a delivery point. Addresses simply describe the location of a piece of geography, while delivery points are the lifeblood of physical shipments: they are approved unique locations served by delivery services such as the U.S. Postal Service. Many people think they are shipping to addresses, but they are actually shipping to delivery points. So from here, your new mantra should be: is it deliverable? This is where our flagship address validation tools come in. Available for US, Canadian and international markets, these services provide real-time verification of deliverability – including flagging of vacancy, returned mail, and general delivery addresses – to ensure accurate contact data at the time of data entry or use. These tools instantly verify, correct and append delivery addresses, using APIs that integrate with your CRM or marketing automation platforms, cloud connectors, or convenient batch services for cleaning your databases without the need for programming. Whichever approach you use, you will leverage our vast infrastructure of up-to-the-minute data from the USPS, Canada Post and other sources, along with sophisticated and accurate address verification capabilities. Our DOTS Address Validation – US 3 service, for example, provides near-perfect match accuracy with updates mirroring the USPS, and sub-second response times that allow you to validate live customer input in real time. 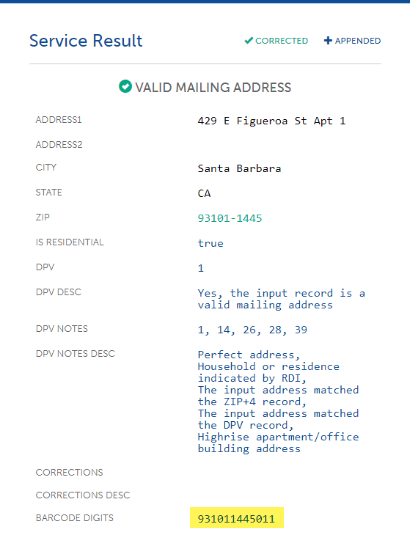 And our industry-leading GetBestMatches operation combines Delivery Point Validation (DPV) to verify an address is deliverable, Residential Delivery Indicator (RDI) to identify residential or business, and SuiteLink (SLK) to add secondary suite information for businesses, all with a single API call to our USPS CASS Certified™ engine. Want to learn more about engineering delivery point validation into your operations? Contact us for friendly, knowledgeable answers from our experienced team of data quality professionals. As a data validation company, we think a lot about how information is collected and stored – and we know that the right approach to data collection can ensure that you start off on the right foot. This blog shares some expert tips for channeling your data into your company’s data stores, in ways that give you the best chance to have this data corrected, standardized, and validated. First, break down your data into its most simple components. By collecting data in its simplest form you can ensure there is no confusion between what the data is supposed to represent and other fields. This is a principle we call separation of data, where each field only contains the most relevant data for its type. In the best case, you have a collection of very specific fields with unique data types – as opposed to the worst case, where you have a group of identical fields collecting your data. 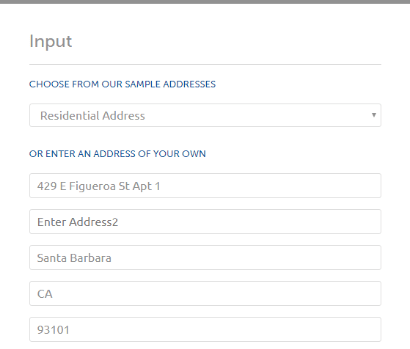 Could a user enter, say, his grandmother’s name in the ZIP code field? If so, you still have some refinement to do here. Next, determine what characters are relevant to each specific field. For example, if you are collecting “Age” data, you know that the data field should be a number. It doesn’t make sense to allow for anything other than the numbers 0-9 (and please don’t get cute and allow words such as “thirty-five”). Extending your requirements further, you could even limit the “Age” field to positive numbers to prevent someone from claiming they are -5 years old. Now, let’s put these two rules to work for two of the most common types of contact data: delivery addresses and email addresses. This is a case where a basic understanding of the data you are collecting will take you a long way. Here we are going to examine the anatomy of a typical US address, as shown in Wikipedia, and then split the individual components into different fields. From this US address example, we can see the recommended USPS format. Within the address, we have the house number and street name (Address1), the name of town (City), the state abbreviation (State), and the ZIP+4 (ZIP/PostalCode). Emails are a bit trickier, but constraints can still be placed on the point of entry. The set of allowed characters in an email is far more expansive than say, postal codes, but there are still limitations. By putting the restrictions in place you can still cut out some of the garbage that can be submitted. In this case, you could examine the individual elements of an email and place restrictions on each. Since an email must consist of a local-part, “@” symbol, and a domain, it is safe to restrict your collected data to only email inputs that conform to the anatomy of an email. For example, an address such as “Input 1: 123ABCSt.foobar@domain.com Thirty-Five” does not end with a legal domain identifier, and also contains illegal spaces within the address and after the closing period. The same techniques can be applied to all of the data that you collect. Some fields may be easier to apply constraints to, but any attempt to filter acceptable input and organize the data into manageable sections will benefit you down the line. We specialize in data validation and have spent over 15 years refining our methods for interpreting, standardizing, and validating data. If data is gathered in component parts we can at least gain context and, even if the data isn’t correct, apply our specialized knowledge to try and validate this information. Finally, give some thought to how your data will ultimately be stored in a data store or database. Since this is the bottom level, it is crucial for database administrators to make educated choices about these data fields. If constraints aren’t placed at the database level, the information you have collected could be rendered useless. Smart choices in data type, accepted data length, and constraints can help ensure that your data is stored in its most sensible form. As with most things in life, an ounce of prevention is worth a pound of cure when it comes to collecting and maintaining contact data accuracy. The techniques described above, in conjunction with Service Objects web services, will help provide you with the most genuine, accurate, and up-to-date data as possible. Who is Service Objects? We are a data validation company that aims to cleanse, append and enhance our customers’ contact data. We are fanatical about data quality, customer service and our 99.999% uptime guarantee (that’s less than five minutes a year, if you are doing the math). We are also committed to reducing wasted paper, time and resources through data quality excellence. We strive to provide the industry’s top contact validation tools to our customers. What does Service Objects offer? We offer 24 different services that our customers can use. These include APIs that validate email addresses, IP addresses, physical mailing addresses, phone numbers and BIN numbers. Our tools can also provide tax rates based on addresses, validate domestic and international lead information, append missing contact information, or even provide demographic data or location intelligence about your contacts. You can embed these real-time APIs in your own contact data platforms, or even use our convenient batch services to clean and validate your databases with no programming required. Either way, we provide you with better data along with a host of associated information. Why would I use Service Objects? There are many reasons! One of the reasons that we are really passionate about is that validated, verified and corrected data helps eliminate waste. 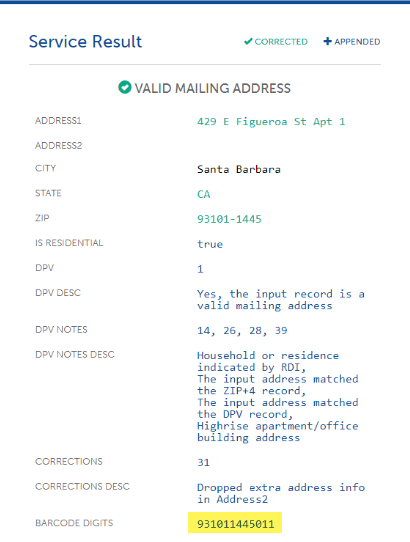 For example, take our flagship Address Validation 3 service: if addresses are run and verified through our CASS certified system, this will reduce the number of mailings that are undeliverable due to bad or incorrect addresses – along with all of the costs and human effort that go along with this. Other key reasons revolve around ROI and profitability. We can validate the quality of your marketing leads, boost sales and target marketing better by offering a more complete view of your customers, reduce shipment errors and service failures, and help you avoid compliance penalties in a world that is increasingly regulating marketing contact activities. Our services can also fight fraud by helping identify high-risk or bad contact information. How do I call a Service Objects web service? This GET request will return an XML version of the response; however, most of our services also offer JSON as an available output type. Requests to our services can also be made through POST or SOAP protocols as well. Below is an example of the response you can expect from our DOTS AV3 service. How do I deal with the response? If you are using a Service Objects subscription to cleanse a database, then you would likely want to update old records with the standardized and validated data. If you are looking to delete old bad data, then you may want to remove any record that receives an error from our service. If you are looking to enhance data, then you will likely want to add notes that we provide in many of our services to your records. If our services are being used in real time, then the results can be used to relay information back to the user inputting it. Potential things to highlight or notify a user about could include that an address is not deliverable, the given phone number is not valid, or the given email address is not deliverable. Each use case is unique! Which leads to one of the best features about working with Service Objects: us. We love to work with our customers to help them get the most out of the services and data that we provide. Contact us anytime to learn more about what we can do for you!